Our Champion Sports dodgeball set is perfect for any number of children’s games, including handball, kickball and four square. From the playground to gym class, these soft but strong balls provide hours of fun and exercise. They’re popular with schools, summer camps, recreational centers, rec leagues and families. Coated with patented Rhino Skin, these 8 inch balls are built to last. They can withstand years of rough play and regular outdoor use. Designed and made in Sweden, high-tech Rhino Skin is so tough that it’s virtually impossible to tear. The quality is tough to beat. Grownups can join in on the fun, too. Dodgeball is a great party activity for summer BBQs, birthday parties, tournaments or any type of adult gathering. Or, get the whole family outside for some action-packed bonding time. The game is entertaining and interactive, and it’s a great way to sneak in some extra physical activity. 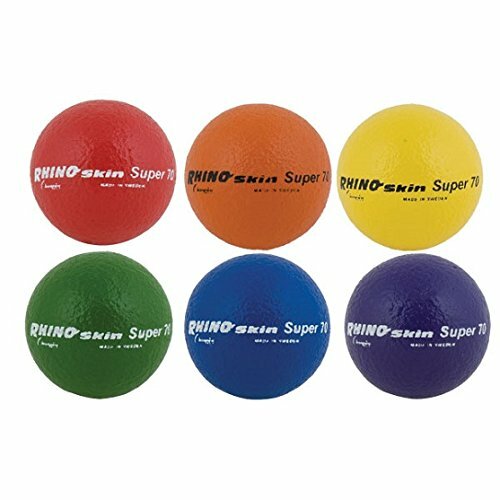 Rhino Skin was designed to be a non-sting coating, so these playground balls won’t hurt or leave bruises when they strike like large rubber balls. Lightweight and spongy, they’re safe for kids to use but rugged enough for teens and adults. Our dodgeballs have a low-density foam core that provides just the right amount of bounce. The balls easily fly when thrown to reach long distances, but they won’t bounce all over the place when they land. The foam core prevents huge bounces so the balls stay in the game area, whether that’s a giant gymnasium or a small driveway.